Windows Vista Service Pack 2 is out on Windows Update. I’ve posted about SP2 for Vista a few weeks ago in my last post, but today I just came across something that I thought I should share. 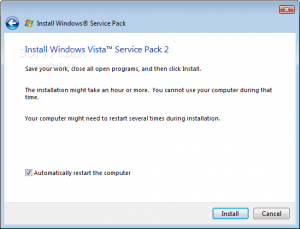 Vista Service Pack 2 is now available through Windows Update. I highly suggest that anyone who has vista do this upgrade as soon as they are able to. This update will help protect against a number of insecurities in Vista and will help with the compatibility of programs and hardware. There really isn’t any performance difference between SP1 and SP2 so you don’t have to worry about sp2 slowing anything down. So check your updates today and Upgrade Upgrade Upgrade! This entry was posted on September 23, 2009, 11:53 am and is filed under Important Notices. You can follow any responses to this entry through RSS 2.0. You can leave a response, or trackback from your own site.